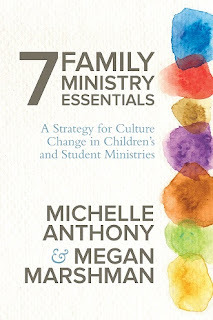 I'm interested in families and their relationships with the church, so I decided to review 7 Family Ministry Essentials: A Strategy for Culture Change in Children's and Student Ministries by Michelle Anthony and Megan Marshman. I didn't really know what I was getting into here. I was thinking this was a book addressed to families, but instead, it is a book addressed to ministry leaders, particularly those in children's ministry. With decades of ministry experience, Michelle Anthony and Megan Marshman capture the guiding essentials of life-changing family ministry. DR. MICHELLE ANTHONY is the vice president and publisher of learning resources at David C Cook and a popular speaker in the area of family ministry. She is the author of Spiritual Parenting, The Big God Story, and Becoming a Spiritually Healthy Family. Michelle has graduate degrees in Christian education, Bible and theology as well as over twenty-five years of family ministry experience. Michelle and her husband, Michael are the parents of two adult children and live in Colorado. MEGAN MARSHMAN is the director of student resources and production for David C Cook and has led and challenged thousands of students in their faith at Hume Lake Christian Camps. With a master's degree in organizational leadership from Azusa Pacific University, Megan speaks nationally at churches, conferences, and university chapels. She and her husband, Randy, live in Long Beach, California. I really like where this book is coming from. One thing I've struggled with is the idea that parents are commanded to be responsible for raising their children in spiritual matters, but too often they don't step forward to do that -- and the church has been more than happy to step into that vacuum and assume responsibility. But that isn't an entirely bad thing either, where parents simply will not do any of that training. A better way seems to be proposed in this book though. The church can still teach, mold, train -- but they can do things in a way that encourages parents to be involved. One idea early in the book was instead of sending take-home papers with the kids after the lesson, why not send materials home with the kids the week before, so the parents who want to be involved can be going through the materials for the upcoming week? Good information here, even if the book was not what I was expecting.